As the fat tyres underneath me fight against around two tonnes of Porsche and the somewhat unreasonable demands of my right foot, I’m fired back onto the main straight of Bahrain International Circuit. It’s about eight o’clock on this tiny Middle Eastern island, and the sun has long since set. 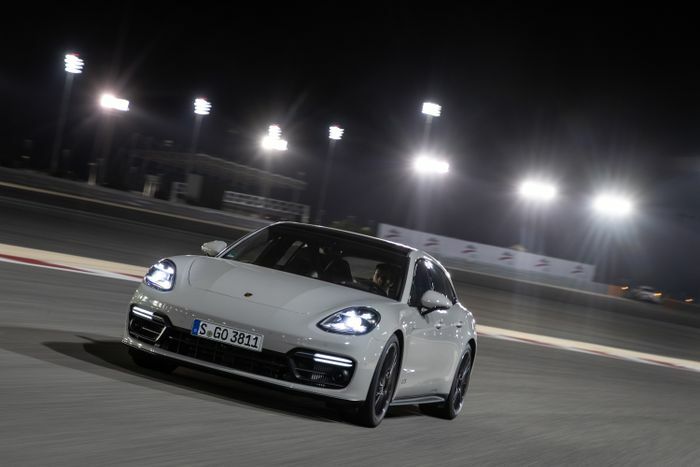 But I don’t need to worry about whether or not the Panamera GTS I’m driving has the optional LED Matrix headlights fitted, as the track’s floodlights - which allow it to host F1’s only ‘twilight’ Grand Prix - have illuminated the main straight to the point where it might as well be daylight. There are 4500 bulbs on nearly 500 poles in total bathing this 15-turn circuit in light, and not consistently - the further parts are darker, making it seem as though you’re smashing into a wall of brightness when you arrive back at the grandstand-lined start-finish straight. It’s all very surreal, so it’s easy to get distracted by the bizarre but brilliant occasion. But I have a car to suss out, and it’s coming off that final turn - with the outer tyres heavily loaded and the traction control getting rather irate - that a thought hits me. At times, this 4.0-litre twin-turbo V8 almost feels like it’s naturally aspirated. 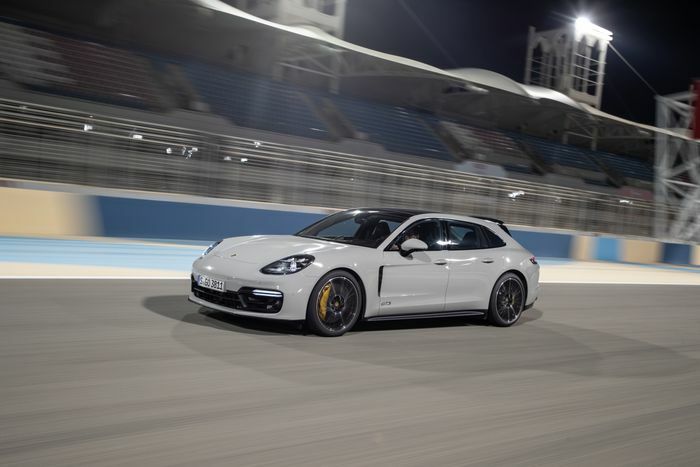 Yep, we do indeed have a V8 here, even though the GTS recipe Porsche has used for the last few years would see the V6-powered Panamera 4S used as a starting point. Panamera powertrain boss Arno Bogl told me earlier today that it’s down to Porsche wanting a more “emotional” engine for the GTS. Perhaps it’s also a factor why some customers and road testers weren’t overly chuffed with the fact the last Cayenne GTS had a ‘mere’ V6. But I’m not bothered about why there’s a V8 here: the point is it has one, and it’s superb. 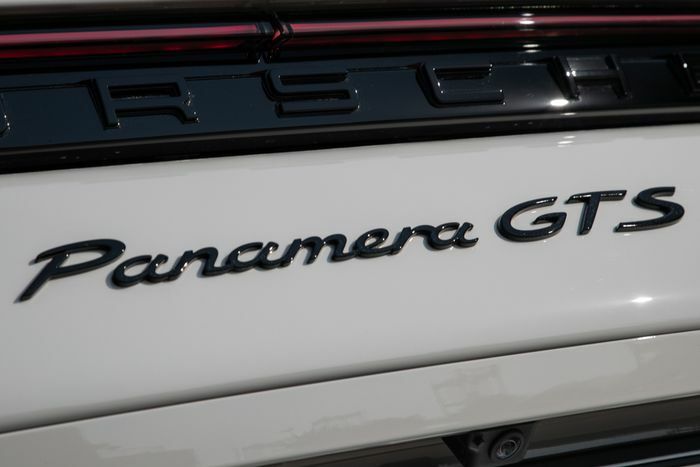 It’s also an engine we’ve seen before: the GTS borrows its 4.0-litre twin-turbo eight-banger from the Panamera Turbo. 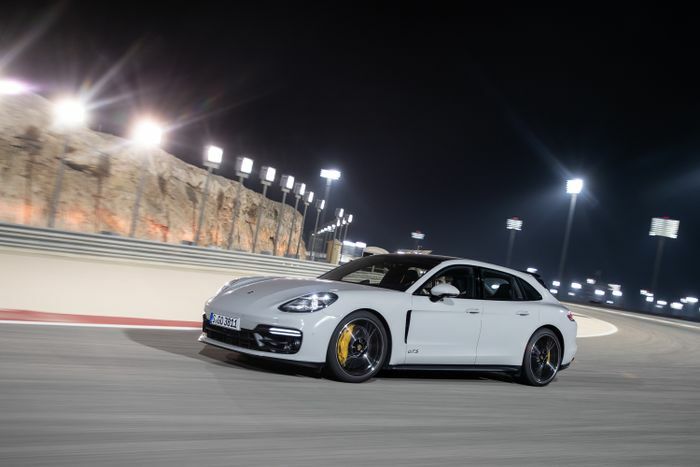 It’s identical right down to the turbos: all Porsche has done is turn the boost pressure down from 1.3 to 0.8 bar, which drops the power from 542bhp to 454bhp, and the torque from 568lb ft to 457lb ft. Oh, and before you go thinking you could just turn it back up with a remap, it is worth noting the Panamera GTS doesn’t have the same gearbox as the Turbo. The Panamera Turbo’s V8 is certainly an effective unit, but not one I found myself falling for when driving the car last year. With the twin-scroll turbochargers turned down, however, the engine takes on a whole new character. Lower pressure means less time waiting for the turbos to come on song, so there isn’t really any perceptible lag. It responds the moment you step on the throttle. Then there’s the power delivery. Coming off Turn 10, which would normally be a third-gear corner, I take it in fourth to see how the engine behaves with a full-throttle pull from low revs. This isn’t like most turbocharged engines, where you get to a 2500-3000rpm boost sweet spot and suddenly all hell breaks loose. Instead, you get a strong, surprisingly linear pull right up to the 6700rpm redline. The almost N/A-like attitude of this take on the Porsche/Audi-developed V8 makes it a much more pleasant engine to thrash than the Turbo’s. It even sounds better, albeit through a little bit of fakery. On the other side of the GTS’s front bulkhead you’ll find a resonator, which does a remarkably good job of enhancing the engine noise. The ECU is tuned to make more pops and bangs too, which adds a nice extra bit of theatre without ever being excessive. 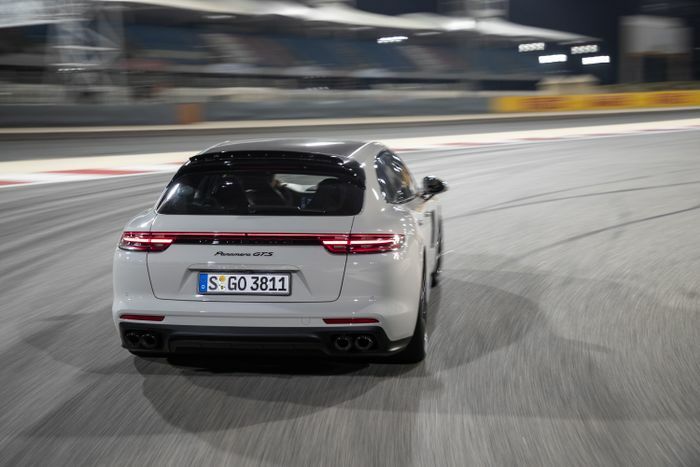 The way the Panamera GTS goes in a straight line certainly isn’t a problem, but what happens when a corner arrives? As hinted at earlier, weight is the car’s biggest enemy, becuase it’s heavy, and it feels it. But it doesn’t feel like quite the fatty it is: it’s much keener to change direction and far better at staying flat when you’re chucking it around than any car of this size and bulk has any right to be. It is, however, worth pointing out that the particular GTS I’m in has had a bunch of optional acronyms thrown at it. PDCC Sport, PTV and PCCB are all present here, along with the standard-fit PASM and PTM systems. Oh, and rear-axle steering, which - curiously - Porsche hasn’t bothered coming up with an abbreviated name for. WTF, right? 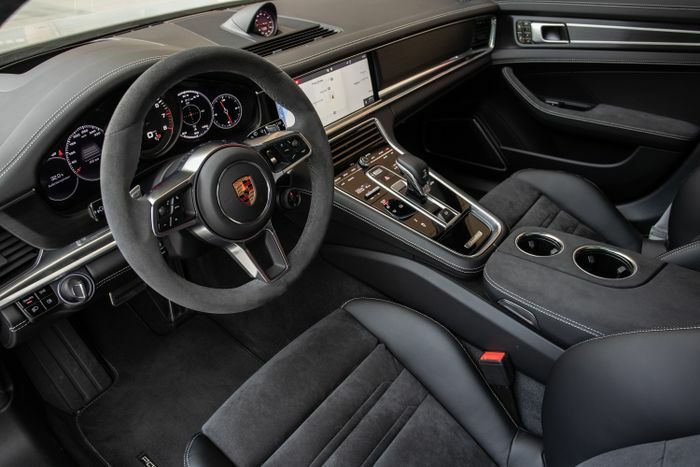 All those letters mean that the Panamera you see on this page has a torque vectoring system which uses an electronically-controlled differential for the rear axle plus light brake applications on individual wheels to help the car more effectively put its power down. It also has carbon ceramic brakes to combat fade, electronically-controlled anti-roll bars, and an extra-sporty setup for the all-wheel drive/traction control systems. It has plenty of science to stop it flopping as though Jabba the Hutt just took up ballet as a hobby, but behind all that there’s a well set-up, nicely balanced chassis. 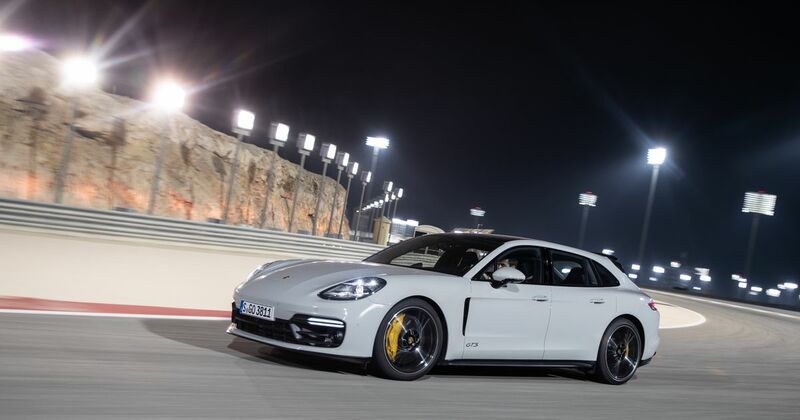 Porsche has always been irritatingly good at making a car handle better than any of its rivals can, and the Panamera GTS is no different. The only issue out on track is the traction control system: even in Sport Plus mode, which should slacken off the electronic aids, it’s too keen to intervene. I find this out on the tight Turn 1, where you want to get on the power fairly early. Do that, and you feel the all-wheel drive system shuffle power to the rear axle to stop understeer, which starts a neat little slide, only for the TC to then aggressively shut it down like a total killjoy. But hey, the GTS isn’t supposed to be a track weapon, even though it’s thoroughly competent and hilariously enjoyable when given free reign at a big race circuit. Back in its natural environment - the road - it’s really not going to be an issue. And so it is with the power: the GTS’s 454bhp may feel a little ‘lost’ on a vast, FIA Grade I race track, but on a good road, you’re really going to appreciate that output. A more extensive road test (the Bahraini roads we tried earlier in the day were mostly straight and flat) will need to happen in due course, but based on what I’ve experienced so far, the GTS is in a real sweet spot. "The Turbo is all well and good, but you’re going to be able to enjoy the full potential of the GTS's detuned V8 more of the time"
The onset of downsizing means that a V8 with a power output starting with a ‘4’ is - bizarrely - starting to become quite rare. Don’t forget, the V6-powered 4S only has 20bhp less than this. The Turbo is all well and good, but you’re going to be able to enjoy the full potential of the detuned eight-banger in the GTS much more of the time. And let’s face it, 0-62mph in 4.1 seconds isn’t exactly slow, is it? Pulling back into the pit lane following a well-earned cool-down lap for the GTS, my mind is made up: this is the Panamera to have. Preferably in Sport Turismo form. Power is overrated.